A special edition of Top Up Cards to promote Sustainable Development Goals in PNG has been launched and will hit the shelves next month as part of new partnership between the UNDP and Bmobile – Vodafone. The partnership will harness the power of mobile network and reach out to communities in PNG with information about the 17 SDGs. The SDG’s are a universal call to action to end poverty, protect the planet and ensure that all people enjoy peace prosperity by 2030. 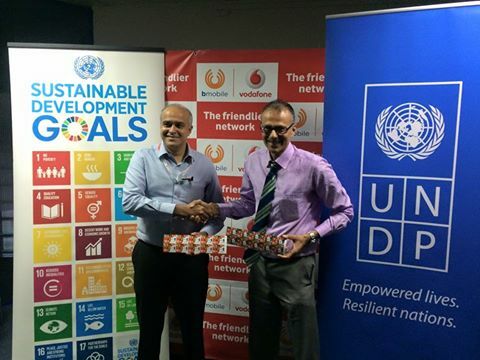 The New Topkads will have logos of the UNDP and SDGs. Each time a customer purchase a card, a message will be sent to their phone about one of the 17 SGD’s and automatically enters into a draw to win prizes including voice SMS and Data package. UN’s Country representative in PNG Mr Roy Trividy thanked Bmobile for coming on board in promoting UN goals as it will provide a pathway for citizens in the country to abide and act up the UN SDG’s.